As promised for the Alpha 3 release there is now a working exit registration and selection screen, as well as a working wifi settings page. This marks our first ‘stable’ release, every two weeks from here on our the latest code will be tested and merged into a new release. In sync with this release existing routers will update from the Althea software package repository. Next week we’ll be transitioning our existing users to this new stable release channel and keeping them there from here forward. 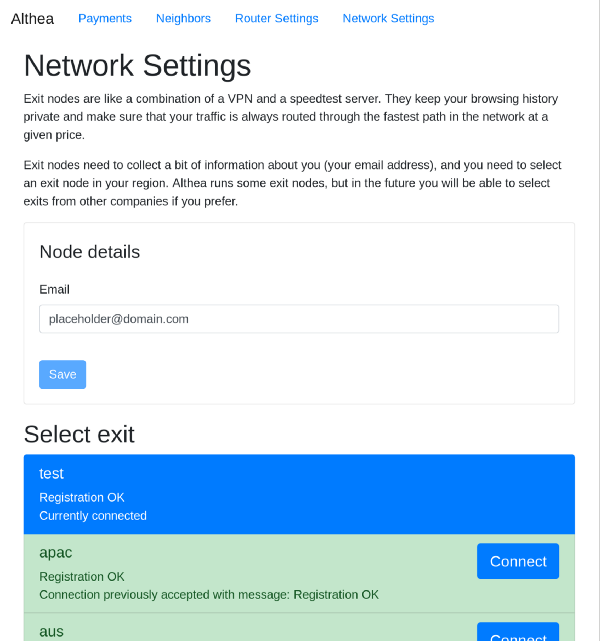 To make the long story short if you’re adventurous you can flash some devices and start an Althea network now. Hook up your neighbor, or just use the system as a convenient whole home proxy. We’ve also announced the details of our planned governance system. I really think we managed to achieve the goals I outlined in my inaugural medium post. The protocol is left slim and tokens don’t get involved anywhere that they don’t bring meaningful improvements. Finally and most importantly we create a simple way for users to opt out while at the same time providing easy and safe defaults without centralization. In other development news features coming up in Alpha 4 include. The neighbors webpage working and showing realtime info about your mesh peers. A bugfix for potential wireguard tunnel collisions when more than one gateway operates behind on the same NAT (no private data is revealed, on the other hand the connection does stop working). An early implementation of full path route verification.